In addition to providing a number of request forms for records on their website, the Iosco County Clerk's office also provides a Vital Record Verification Service to help confirm the validity of any records persons might have that are in question. Up to two researchers at any one time are allowed in the Clerk's genealogy research area, which is open Monday through Friday from 10:00AM until noon, and then 2:00PM until 4:00PM. Access to birth records is restricted to individuals actually listed on the records, however death, marriage, and divorce records are all open to the public. Death and marriage records are available from the 1860s to the present, and divorce records are listed from the early 1900s to the present. 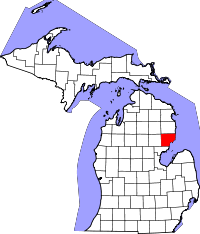 Individuals planning on visiting the County Clerk's office should go to 422 Lake Street in the county seat of Tawas City, MI.